Our Union has sued SERS over the 3-Year COLA freeze imposed on nearly 80,000 retired school employees. Below is the news release that explains the lawsuit. And you can read the lawsuit by clicking the link at the end. 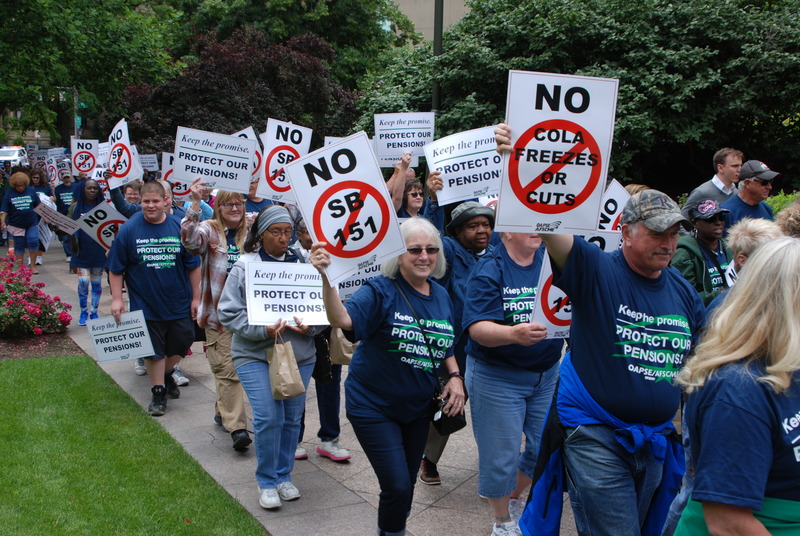 For additional background on OAPSE’s fight to protect pensions, check out our new video below. The Ohio Association of Public School Employees (OAPSE/AFSCME Local 4) today filed a lawsuit against the School Employees Retirement System of Ohio (SERS), Ohio Attorney General Mike DeWine and Cavanaugh Macdonald Consulting, an actuary firm hired by SERS. Filed in Franklin County Court of Common Pleas, the lawsuit seeks to halt the three-year cost-of-living freeze imposed by SERS in October. The COLA freeze impacts nearly 80,000 current retirees, who average a monthly pension benefit of $1,223.33. The lawsuit details years of poor investment decisions and extravagant payments to Cavanaugh Macdonald and other external financial managers as well as internal investment consultants. OAPSE points out that SERS has spent a staggering $852,393,157 on outside investment fund management fees since 2007. And since 2001, external investment expenses have increased by more than 214 percent, while the SERS fund balance increased by only 64 percent. During that same period, the lawsuit notes, the Dow Jones Industrial Average (DJIA) and the Standard & Poor’s 500 (S&P 500) outperformed the SERS growth rate by more than 40 percent. “This is absolutely a criminal waste of resources by SERS. They spent $852 million – and that’s just on outside consultants – only to get a smaller return than they would have from a savings account. It’s a pathetic investment performance, and as a result of their ineptitude, OAPSE retirees are being forced to do without the cost-of-living increases they desperately need. It’s wrong, and we had no choice but to sue to stop this,” said OAPSE Executive Director Joe Rugola. *Since 2000, SERS has expanded benefits without providing for increased funding sources, which contributed to a reduction of its funding ratio from 102 percent to 62 percent. *SERS pension fund has a market value of $13.7 billion and pays hundreds of millions of dollars to outside investment managers to make less than the market indexes, but says it cannot afford to pay retirees earning an average pension of just $1,223.33 per month an additional COLA amount of $30.58 per month. *SERS continues to invest in hedge funds, which have historically underperformed more traditional investments and require higher commissions and fees than traditional investments. *OAPSE is challenging whether the three-year COLA freeze complies with Ohio law that mandates an annual review of the COLA. *COLA decision to SERS when it violated the state’s one-subject provision by including the COLA freeze in a massive budget bill unrelated to SERS and COLA policy. *By enacting the COLA freeze in the manner it did, SERS has improperly created different classifications of retirees, thus violating their equal protection rights under the law.